APPSC Assistant Motor Vehicle Inspectors Hall tickets, Exam Dates 2019. APPSC Assistant Motor Vehicle Inspectors Screening Test Date and APPSC Assistant Motor Vehicle Inspectors Main Exam Date 2019: APPSC issued the APPSC Assistant Motor Vehicle Inspectors Recruitment 2019 notification and Andhra Pradesh Public Service Commission invited the online applications from the eligible and interested candidates for recruitment to the Assistant Motor Vehicle Inspectors in A.P. Transport Subordinate Service. Andhra Pradesh Public Service Commission (APPSC) will release the admit card /hall ticket of APPSC Assistant Motor Vehicle Inspectors Screening Test on ... and After Andhra Pradesh Public Service Commission (APPSC) will release the admit card /hall ticket of APPSC Assistant Motor Vehicle Inspectors Main examination on 17-04-2019 Forenoon & Afternoon. 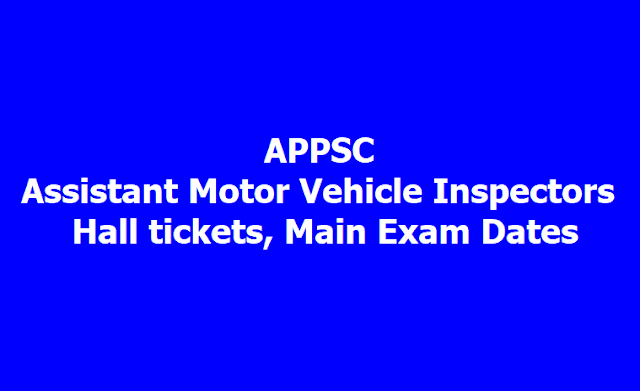 APPSC Assistant Motor Vehicle Inspectors Screening Test hall tickets: The APPSC Assistant Motor Vehicle Inspectors Screening Test hall tickets to be available on the official website https://psc.ap.gov.in/. Candidates who applied for Assistant Motor Vehicle Inspectors recruitment examination can visit the official website to check and download APPSC Assistant Motor Vehicle Inspectors hall ticket 2019 for Screening Test. The candidates need to enter their user ID and mobile number to access the hall ticket. 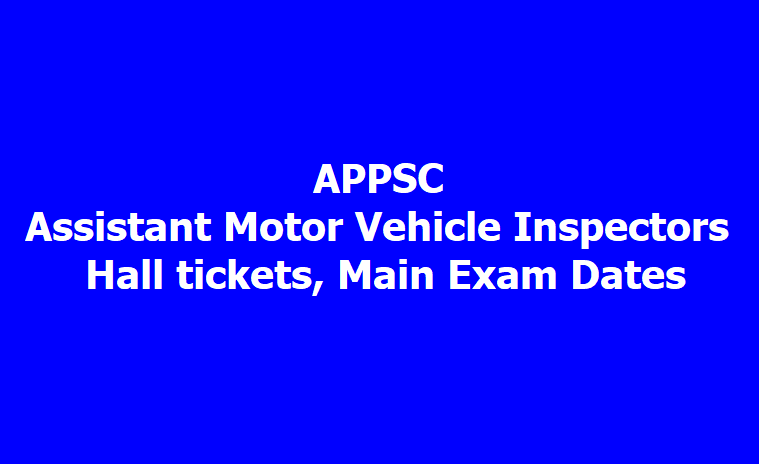 APPSC Assistant Motor Vehicle Inspectors Main Exam hall tickets: The APPSC Assistant Motor Vehicle Inspectors Main Exam hall tickets would be available on the official website https://psc.ap.gov.in/. Candidates who have qualified in Assistant Motor Vehicle Inspectors recruitment Screening Test can visit the official website to check and download APPSC Assistant Motor Vehicle Inspectors hall ticket 2019 for Main Exam. The candidates need to enter their user ID and mobile number to access the hall ticket. The APPSC conducts Assistant Motor Vehicle Inspectors Recruitment examination to recruit candidates for the Assistant Motor Vehicle Inspectors in A.P. Transport Subordinate Service. Revised Exam Scheduled in Assistant Motor Vehicle Inspectors - Notification No.11/2018 - Screening Test to be held on Screening Test on .... and The Main Examination will be as scheduled on 17-04-2019 Forenoon & Afternoon. APPSC is going to conduct the Screening Test for Assistant Motor Vehicle Inspectors Recruitment and which will be held on Screening Test on .... APPSC is going to conduct the Main Exam for Assistant Motor Vehicle Inspectors Recruitment and which will be held on 17-04-2019 Forenoon & Afternoon. Candidates can download the Hall tickets from the Official Website. APPSC Assistant Motor Vehicle Inspectors Hall Ticket: How to download?